Avinash it’s a huge success. How was it received? Take us through the very special moment. Actually I was about to sleep, when I came to know that the GATE 2019 result is to be announced. So I checked the result casually. I knew that my rank would be good, but I didn’t expect that it would be so good. It was a very great moment for me. This shows that how much effort I must have put in to get this rank. My shift was second in afternoon session for GATE. Before normalization, I secure 88 marks. After normalization, my marks were 85.75. As the second paper was comparatively easy, due to normalization, my marks got reduced. What worked for you in GATE 2019? Hard work… I believe that only hard work counts in GATE. Nothing else, and sometimes a little bit of luck as well. You can get 100 rank by just doing hard work, but to get single-digit rank you need sheer luck, which I got. I feel lucky for that. How was this year’s GATE paper? According to me, Paper-2 was very simple, and most of the questions asked were similar to those asked in IES Master Test Series. As I had taken the test series, for me the paper was simple, but for most of the aspirants the paper was tough. How was section 1 in GATE 2019? Section 1 was very easy, apart from English (as my English is weak), aptitude wise the paper was very good. Every person can answer the aptitude questions. You don’t need to focus much on aptitude, as the questions from aptitude are very simple. How different was section 2 of this year from previous year’s? Technical part was not much different. You need concept-wise learning. The most important thing about GATE is that you need to remember all the formulas. If you forget one formula then you are going to lose at least 2 marks. Other than this, you need to focus on some important things like this year one question was asked from Soil Mechanics for general sheer failure and for local sheer failure. Everybody attempted it using the general sheer failure, but the question was for the local sheer failure. So you have to take care of such little things, and thereafter by applying formula you get the correct answer. How did IES Master classroom program benefit you? IES Master classroom program helped me a lot. The books and teaching material of IES Material are very good. It’s so good that you need not to refer the standard books. If you follow them religiously, you need not do anything else. Keep on referring them again and again, and the more you do so, your rank will be good. The teachers at IES Master are fantastic. They motivated me. Their way of teaching was very good. In a simple manner, you can easily understand difficult topics. The way Kanchan sir teaches SOM is very easy. I still remember his ‘E को/ E में ‘dialogue. I will never forget it. Competition-wise the Classroom Program is very good. Students from different colleges are a part of it, and you get to experience a healthy competition which you are going to face in the real GATE exam. Apart from it, the teaching methodology of Classroom Program is excellent. All the teachers are well qualified, and explain in simple language. All the possible questions are covered in the class itself. Whatever is remained is covered during other programs such as test series, etc. I would say that almost 100% of GATE syllabus is covered in the class itself. Classroom program worked wonder for me. I used to attend the classes daily and learn the concepts. Everyone works hard, but the proper guidance that is required was provided to me by the classroom program. Take us through your daily schedule? I used to get up half an hour before the time of my class. There was no such fixed schedule. Whenever I feel like studying, I used to study. If I was not in a mood of studying then I would not study. My routine was something like this. How was IES Master Study Material helpful in your preparation? The study material of IES Master was so good that I did not refer any other standard book. I followed the study material only. In the study material every minute detail is covered, along with examples. Solving the examples helps in concept building, which really helps during the exam. How was IES Master Test Series helpful to you? The test series of GATE was very good. In it all the questions were covered. In total there were 71 tests. If you calculate the total number of questions then it sums up to around 250 questions. My target was to solve 200-250 questions daily. In this way, I solved all the questions. I never attempted any test completely for three hours except one test. What I used to do was to open the test, and press the Submit button directly. After that I used to open the solutions, and then practice questions from there. This helped me save time. As there was very less time remained in January month, I have to follow this practice. When I took GATE exam in real, I faced many questions similar to that I had attempted in test series. This made me think that the GATE paper is very simple, I never thought it would be so simple. Luckily all my answers were correct, and I secured AIR-2 in GATE 2019. What was your overall preparation strategy? I used to first concentrate on one subject only. When it was completed, I used to take another subject. In January, when I had to write the test series, I covered the GATE book chapter-wise. There was no such schedule. My target was to attempt 200-250 questions in a day so that I can complete the entire GATE book in 10-12 days. For instance, if on any particular day I completed 6 subjects then 10 questions were from one subject, 20 questions were from another subject, and so on. In this manner, for 3-4 days I used to focus on 6 subjects. Later on there were days when I covered 2 subjects in a day. But my main target was to attempt 200-250 questions. This was my schedule for January month. Prior to that I used to complete one subject in total, and then move on to next subject. How did you go about preparing short notes? Short notes are very important for a GATE aspirant. Every aspirant should make short notes. They help us in quick reference of the formulas while solving questions. The short notes I prepared were of formulas only, and before sitting in the real GATE exam, I went through it thoroughly at least 20-25 times. This helped me in memorizing the formulas. So short notes are very important as in an exam like GATE remembering the formulas is very important. If you would not remember formulas then it would be difficult for you to proceed further. If all the formulas are known to you then it will help in boosting your confidence. Sometimes you would be even able to answer the questions that you would find difficult during the exam. What was your approach to avoid negative marking? My main objective was to score at least 80 marks. If you want to score 80 marks then don’t think much about negative marking. My advice is to attempt maximum to maximum questions, and do not attempt questions you are not sure about. There is not much negative marking in GATE as most of the questions are of NAT type that does not have negative marking. So only a few questions are left that have negative marking. So, don’t think much about them, attempt as much questions as you can. That’s more important. Take us through your classroom environment here at IES Master. How is it like sitting here in the class at IES Master? There is a great competition in the class as students from good colleges come here for coaching. The environment here is that of healthy competition, and in such a high level competition, getting on the top is a huge achievement. What I feel is that a student faces competition from all over India here itself in the classroom. If you achieve success here then it means you have cracked the exam. Every student studies and works hard, but the competitive environment that is required is provided here in the classroom itself. How disciplined were you with your preparation? Discipline is very much important as daily the classes are of 6-7 hours, and sometimes they run up to 9-10 hours. After attending the classes, you have to devote 5-6 hours for self study. This makes the schedule very tight. If you are able to live in this schedule, you’ll survive, otherwise it becomes very difficult. This schedule instills a sense of competitiveness in you. 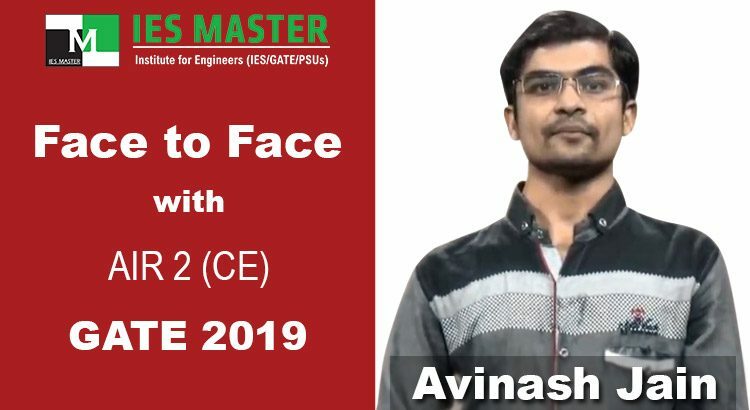 How is your experience with IES Master conventional question practice program? 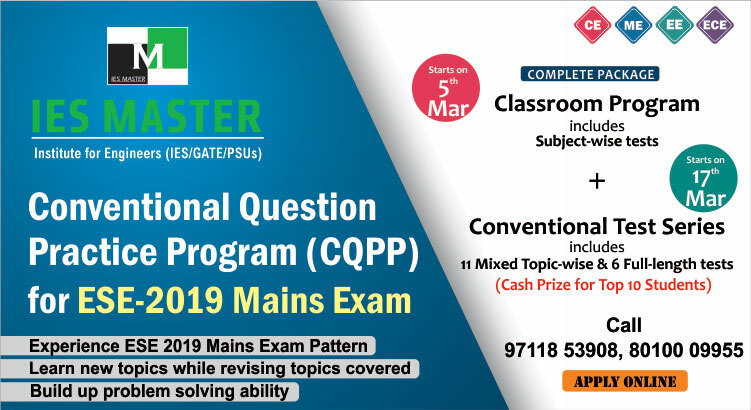 Conventional Question Practice Program (CQPP) actually helps you in not wasting your time at home. When you attend classes, you get to even practice the questions that you cannot solve. By attending CQPP, your 5 hours will be completely devoted to studies and practicing questions. If you come across any question that you are unable to solve then wait for some time, and when Kanchan Sir starts solving them understand it carefully. Try to solve them on your own first. Do not wait for sir to solve them. If you get stuck anywhere, move to another question. I am following the same strategy currently during my Conventional Classroom Program at IES Master. From where you completed your schooling? I completed my 9th and 10th standard schooling from Jawahar Navodya Vidyalya, Alwar. Prior to that I was in SPS Public School from 1st to 8th standard. I completed my Senior Secondary schooling from Jawahar Navodya Vidyalya, Boondi. After completing my B.Tech from IIT Roorkee, I came here at IES Master. I have one brother, and my mother and father in my family. My father is a government school teacher, and my mother is homemaker. My brother works as a clerk in SBI. Other than this, I have my grandparents, uncle-auntie, etc. who all live in village. Only my family lives in Alwar. My village Senthli, which is my birth place, is 20-25 kms away from Alwar. My primary education was completed at my village only. What would be your message to the students of IIT Roorkee? I would like to say to them that start preparing for GATE from second year itself. Prepare tutorials and practicals on your own so that when you write GATE or ESE exam during your fourth year, you benefit from it. If you start preparing from now then there would be not much burden on you. Read a little bit daily, and enjoy the college life of IIT. Whatever is taught in the classes, read it thoroughly. That would be enough. After that during the fourth year, give your best. Thank you Avinash, we are very much proud of you. May God bless you in all your future endeavours. Thank you sir! It was very happy moment for me, and I would like to congratulate IES Master and my family for making me capable of scoring this rank.